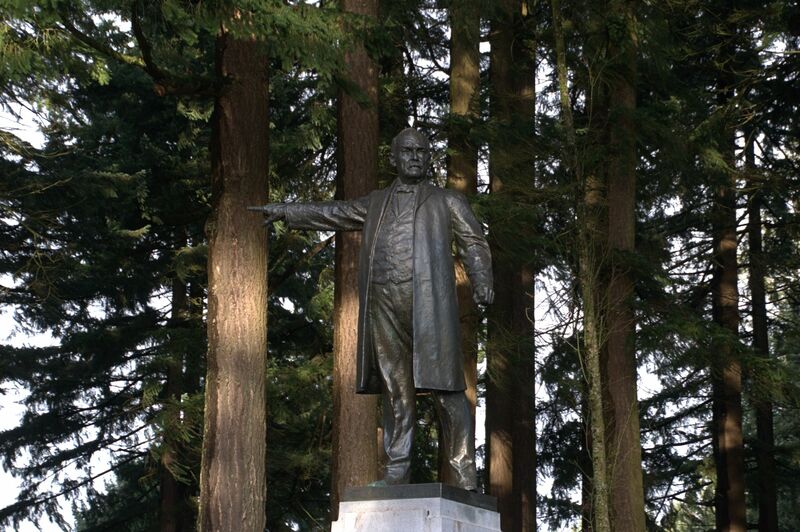 Harvey W. Scott, editor of The Oregonian, has pointed to the city below since 1933. What else to do on a rainy, windy January morning than walk up to Mt. Tabor Park and see who else chose to go outside. It’s a lovely park in every season and people arrive in any weather. I was distracted on the way by beautiful old neighborhoods with their lovingly created gardens. 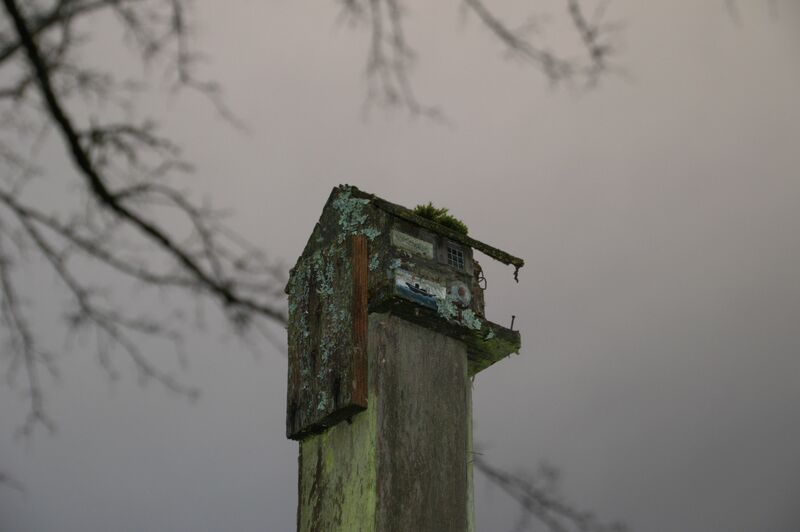 If I walk slowly and look in every direction, I inevitably find something I haven’t seen before, like a darling miniature bait & tackle shop used as a birdhouse, weather-worn and moss-covered. 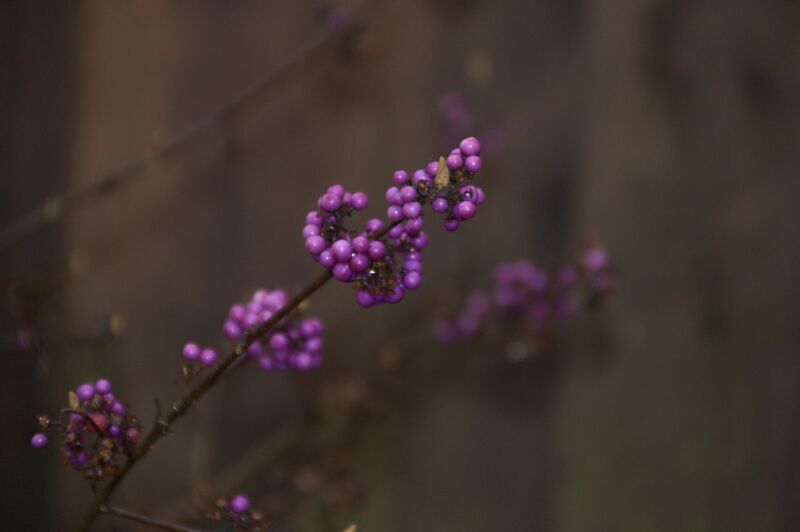 I also enjoy watching the plants in other people’s yards in different seasons, and then choosing which plants to add to my own yard to keep it interesting year-round. On Mt. Tabor I found everyone I expected to find: runners and cyclists circling the dormant volcano on its spiraling roads. Sweethearts holding hands without gloves, despite the rain. One photographer inside the cone itself, which has now been shaped into a mini-amphitheatre that hosts free summertime concerts. A professional photographer, an assistant holding a light, and a lovely young woman in dark clothes against dark skin with gorgeous gemstone-green streaks in her hair, most likely hiring graduation photos. Moms and dads with strollers and my personal favourite: a dad walking hand in hand with his 3-year old daughter, each sporting wild blonde curls blown in the wind and unrestrained by anything hat-like. Trail through the trees on the east side of Tabor. 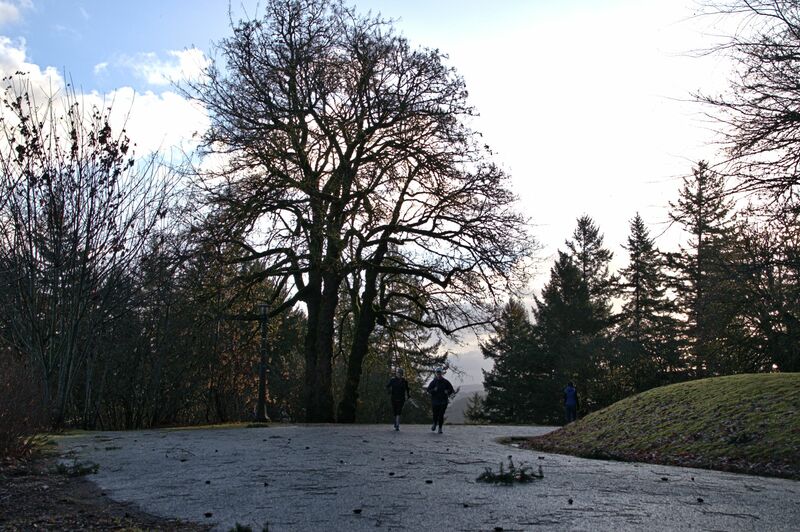 Joggers near the top to Tabor. Debris from the night’s storm lays in the road. 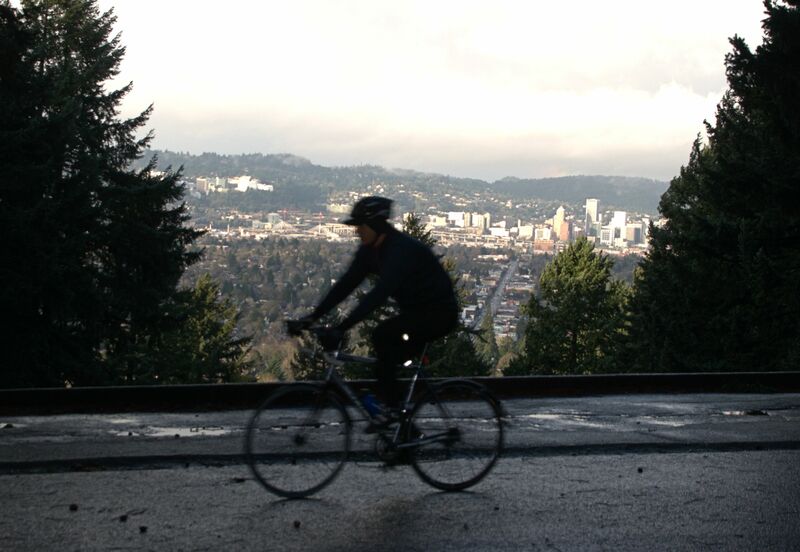 A cyclist rides in the shade while a morning sunbeam lights up Portland in the Willamette valley. Mt. Tabor park is large enough to have crowds of trees as well as open fields, ponds (ok, ok, they are the city’s water supply), trails, paved roads, and several outbuildings as well as one administrative office. This time I noticed how darling the public bathrooms are. 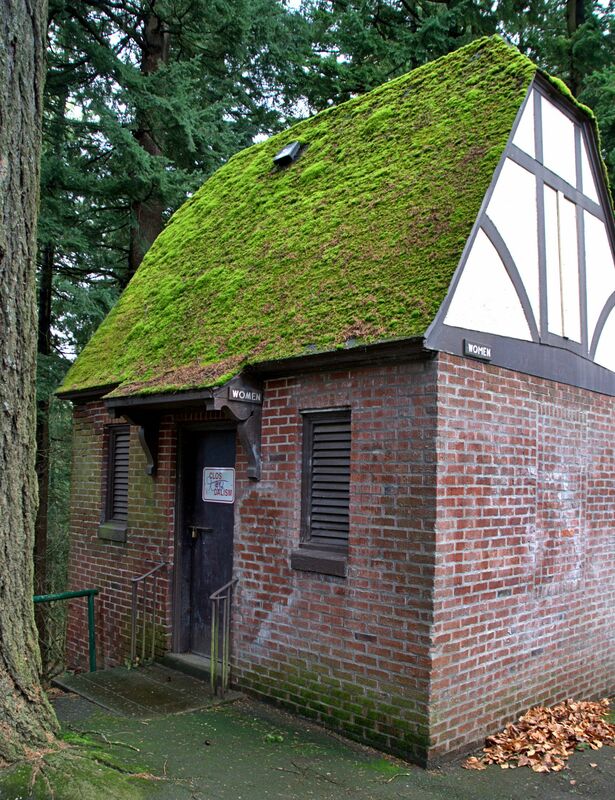 I think it’s a sign of how old the park is, that the public bathrooms are built of stone and brick and stucco. Someone took the trouble to design them in half-timbered style, with turrets, like something one might expect the Seven Dwarfs to live in. Bathrooms near the center of the park. Near the top, this bathroom is closed due to vandalism. 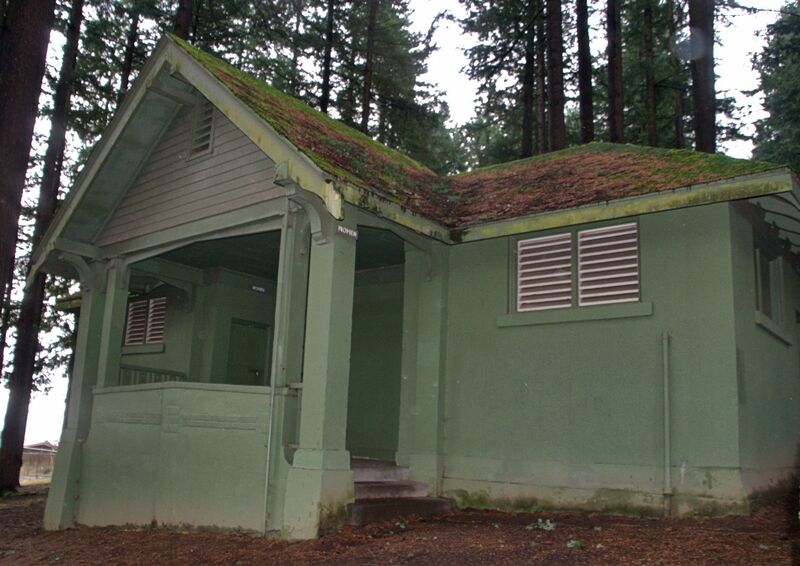 This bathroom is on the east side, near the tennis courts. I’m always talking about how great Portland people are, and the people are great, yes, but not to a soul. Sadly, one bathroom holds a sign stating “closed due to vandalism,” and the sign itself is tagged. The brick walls of the building have been recently scrubbed, but clearly bear the marks of earlier spray paint. Sigh. We have our troublemakers who spoil it for the others, too. Just like any city. But I have hopes that maybe in the summer time, and maybe when the park budget is improved, we can have open facilities in all locations on our little volcano in the middle of the city. 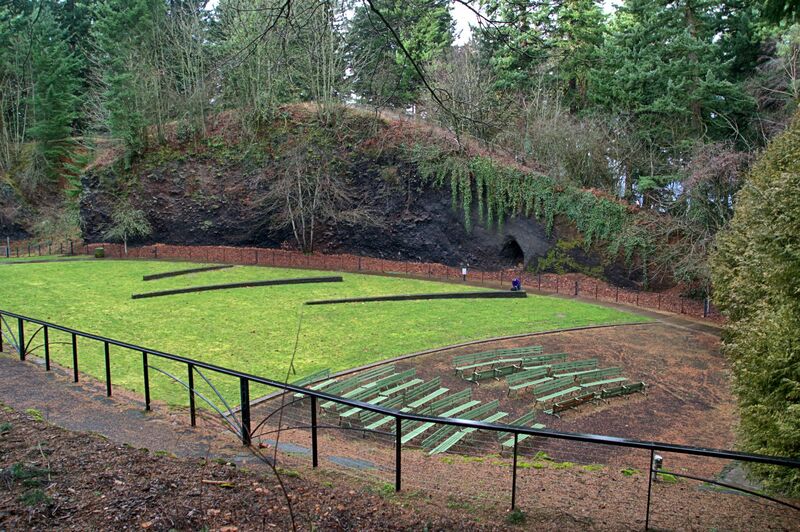 The amphitheatre in the center of the dormant cone, which still shows blackened rocks. Beautiful! 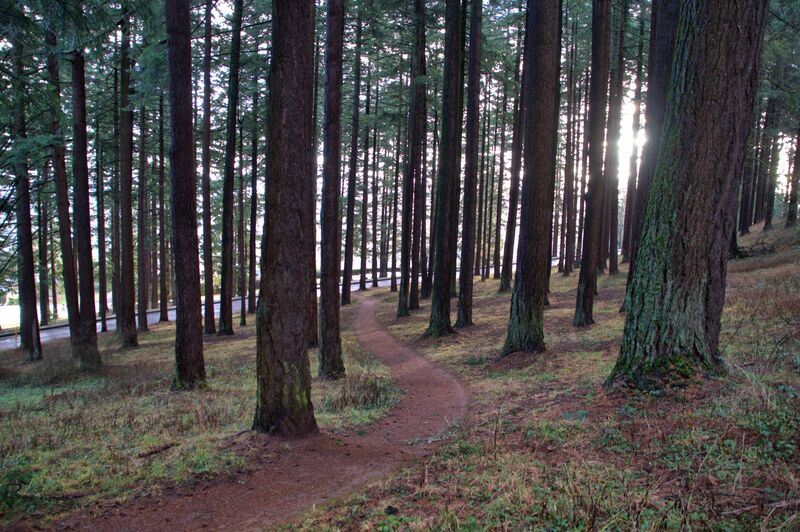 I especially like the trail among the trees. But you are right, the bathrooms are adorable and interesting. I love the Seven Dwarfs bathrooms the best. I am so lucky to have this large and beautiful and interesting park within walking distance from my house. It’s a great place to go and get my mind to thinking about things. Looks like a fabulous retreat. What a great park! And yes, the bathrooms are indeed wonderful, and have such character. 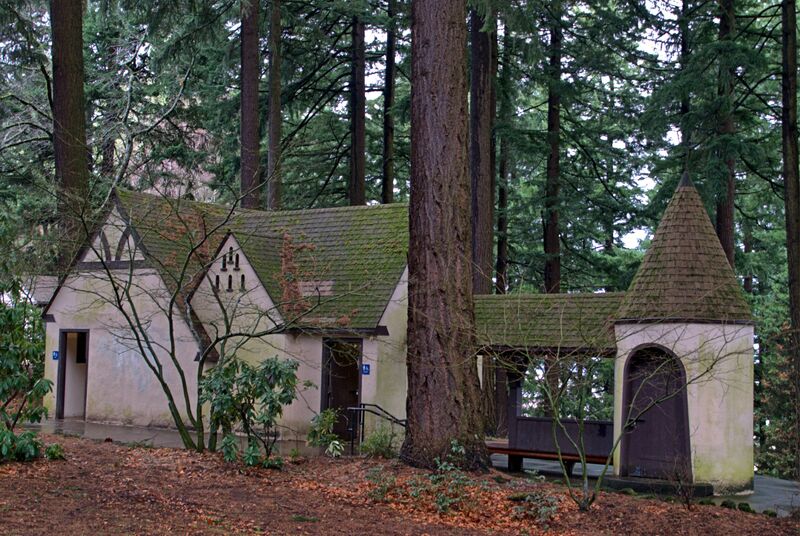 Your pictures really show the uniqueness of the park and prompted me to do a bit of research about Mt Tabor. There’s a neat picture on Wikipedia showing downtown Portland, Mt Tabor, and in the distance, Mt Hood. So neat!!! There is so much going on at Mt. Tabor, and I’m not even talking about the events staged there. Instead, I mean the history of the place. I should do as you did and research some more and write about the volcanic cone, it’s history as a park, and as a reservoir for the city.